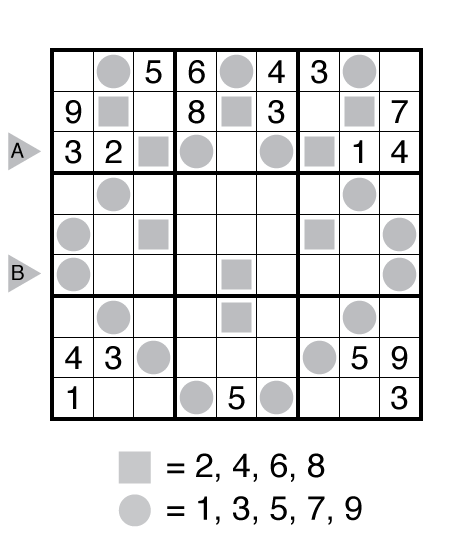 Author/Opus: This is the 9th puzzle from guest contributor Ashish Kumar. 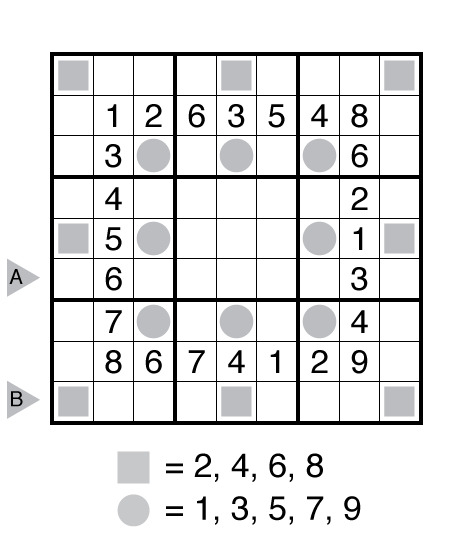 Author/Opus: This is the 320th puzzle from Thomas Snyder, aka Dr. Sudoku. 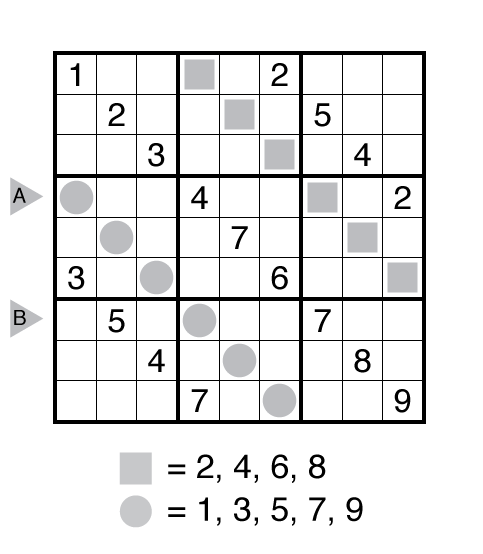 Rules: Standard Sudoku rules. Also, digits in circles must be odd and digits in squares must be even. 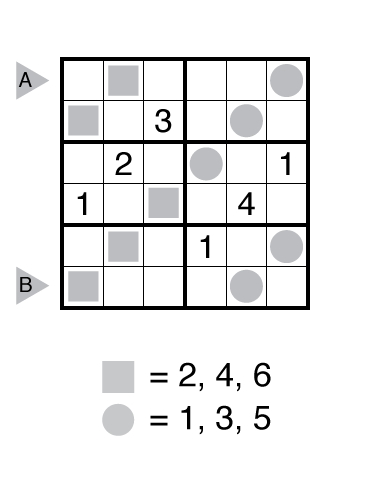 The range of this puzzle is 1-6. 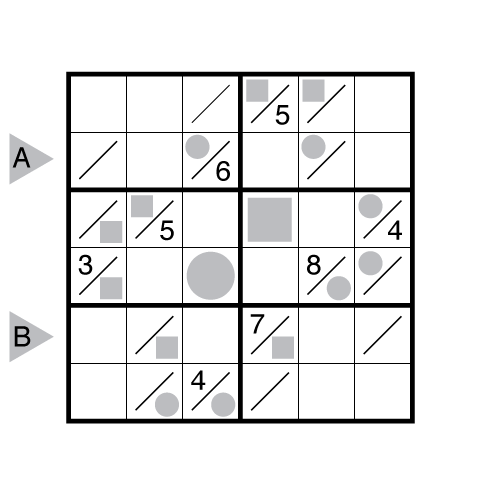 Author/Opus: This is the 4th puzzle from guest contributor Ashish Kumar. Answer String: Enter the 4th row from left to right, followed by a comma, followed by the 7th row from left to right. Author/Opus: This is the 1st puzzle from guest contributor Kishore Kumar Sridharan. Answer String: Enter the 3rd row from left to right, followed by a comma, followed by the 6th row from left to right. Author/Opus: This is the 200th puzzle from our contributing puzzlemaster Serkan Yürekli. 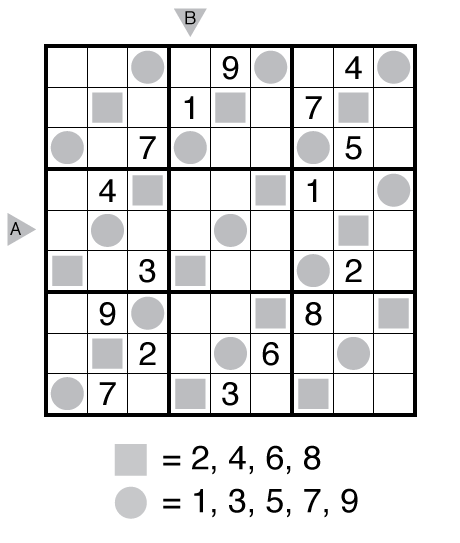 Author/Opus: This is the 166th puzzle from our contributing puzzlemaster Serkan Yürekli. 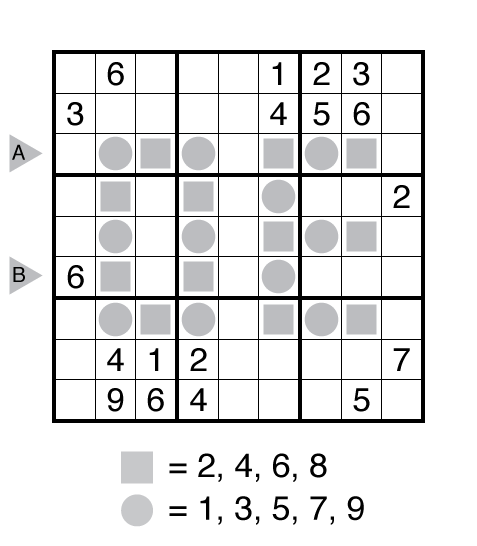 Rules: Standard Sudoku rules. Also, cells with a square contain an even digit; cells with a circle contain an odd digit. Answer String: Enter the 5th row from left to right, followed by a comma, followed by the 4th column from top to bottom.